Allow me to introduce you to Flopsy the Skull Bot! Author CaycePublished on October 6, 2016 October 6, 2016 Leave a comment on Allow me to introduce you to Flopsy the Skull Bot! Published on October 6, 2016 October 6, 2016 Categories Electronics, Project, RoboticsLeave a comment on Allow me to introduce you to Flopsy the Skull Bot! Author CaycePublished on September 14, 2016 Leave a comment on Type Bot Lives!! Neo, Emily and I built this following instructions from a special edition of Make:. We're going to build it at our next club meeting! Published on September 14, 2016 Categories Electronics, Project, RoboticsLeave a comment on Type Bot Lives!! This is one way to build the replacement gauge for Servo's Dashboard. Please ensure that you have the appropriate materials before you start this challenge. Materials such as: Scissors, x acto knife, glue/cement, some cardboard or plastic and either some colored pens/pencils or a color printer and some software will be helpful. I used Microsoft Excel and a color printer for this, but you can use anything you like! 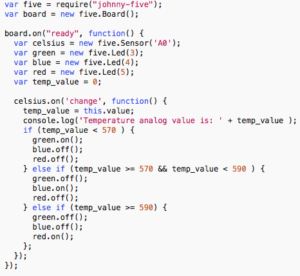 The sensing temperature experiment is pretty fun. The 1k thermistor is the larger of the two packages, in case you were wondering. 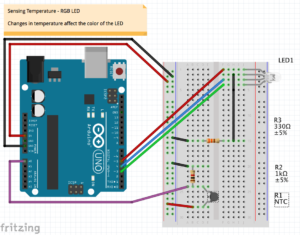 So, were you able to make a solution for changing the color of an RGB LED when you squeeze the thermistor to warm it up? 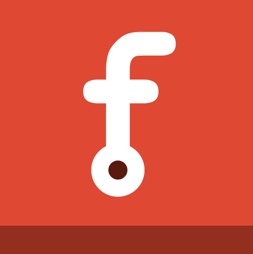 Author CaycePublished on July 10, 2016 Leave a comment on Fritzing!! To me, this is a particularly amazing and useful tool for electronics enthusiasts. Published on July 10, 2016 Categories Electronics, Learning Opportunity, Project, Robotics, Thing of InterestLeave a comment on Fritzing!! Author CaycePublished on July 10, 2016 July 10, 2016 Leave a comment on Soldering….Comic book?! YES! Learning how to solder is a critical skill in electronics. The approach taken in this comic book is easy to read and understand and funny! Announcing the “Soldering is Easy” Complete Comic Book! Published on July 10, 2016 July 10, 2016 Categories Learning OpportunityLeave a comment on Soldering….Comic book?! YES! This issue features the first board produced by the crew at podpi.com!! Super Excited to get the new issue of Island of PodPi. This video is the unboxing of Issue #3 with an 8x8 LED Matrix! Author CaycePublished on May 28, 2016 Leave a comment on Robotic Heads!! I've been studying some robotic heads lately. I've saved some plastic bits, purchased some wooden bits and I've still got to get some fasteners. Published on May 28, 2016 Categories Project, RoboticsLeave a comment on Robotic Heads! !